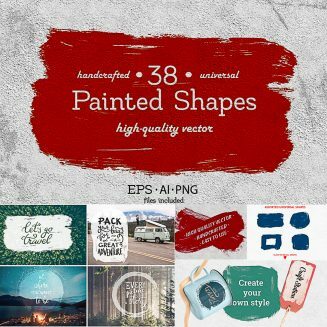 High-quality Vector Painted Shapes. Included files contains over 38 shapes and painted white wall texture, which i used in presentation!+12 Painted style vector brushes as Bonus!. EPS, Ai, Png files.This product goods for creation backgrounds for lettering, artistic patterns, shapes for logos, boarders for text, frames for quotes, helps in creation own poster and really more. Tags: banner, brush, circle, frame, grunge, hand crafter, ink, painted shape, shape, splash, stain, stamp, texture.